Yesterday on The Science of Sport Twitter account, I posted a graph taken from a recent publication analyzing the change in demographics of the marathon. It showed what I’m sure most followers of the sport are familiar with – the rise and rise and rise of African running, from about 1990 onwards. So startling was this emergence that the percentage of Top 100 performances in the world each year belonging to Africans went from 16% in 1990 to 94% in 2011, with a few bumps along the way. The graph is reproduced to the right. Co-incident with this rise is the implicit decline (it’s a zero-sum game – more from African means fewer from somewhere else) in the contributions of other continents to the Top 100, with Europe paying the largest cost, losing effectively 50% of their “market share” over the same period. That’s partly because the level of the Europeans declined, generally speaking – if you look for example at the ranking lists from 1990, you’ll see a host of Europeans running under 2:12, something that is less common today. Mostly, though, the Africans have changed the entry criteria into this group. Consider for instance that in 1990, the Number 1 marathon performance was 2:08:16 (Steve Moneghetti of Australia) and the 30th best time was 2:11:13. Then compare that to the times of 2012 – 2:04:15 was Geoffrey Mutai’s world leader, 30th place belonged to a 2:06:17, and that 2:08:16 that was good enough to be #1 only 22 years before? It would now feature down in 107th place! So the marathon has seen a quite extra-ordinary leap forward in performance. Driven almost exclusively by East Africa, it’s one of the more fascinating phenomena in exercise science and sport. It’s a subject I’ve been looking at a lot more closely in the last year as well. Together with a visiting colleague from Spain, Dr Jordan Santos, we’ve been tackling the African running phenomenon and will continue to do so over the next few years. We’ve had some elite Kenyans visit Cape Town for a few weeks, to conduct tests and measurements that we hope are novel contributions to help explain elite endurance physiology, and we’ve got some ideas about biomechanics as well. Our journey started last year when I was invited to submit a review article for the British Journal of Sports Medicine, and Dr Santos and I worked with Prof Malcolm Collins, a geneticist, to produce this paper: “The genetic basis for elite running performance“. It explains some of the previous attempts to attribute Kenyan endurance dominance to genes, and why those efforts are largely doomed to failure because by the design of the studies (case control) combined with the complexity of physiology and performance. When considering the dominance of the East Africans, particularly the Kenyans, one of the most fascinating aspects is how concentrated the success has been. It has almost exclusively been a Kalenjin phenomenon, rather than a Kenyan one. We speak of Kenyans only because that’s the vest and anthem worn and played at Olympic Games, World Championships and Major Marathons, but the reality is that the man or woman likeliest to own a medal or world record comes from a very specific tribe, the Kalenjin. Describing this is next on my list of priorities, and within the next few weeks, collaborating with researchers in Kenya, I’ll hopefully produce a paper on the demographics of the very best Kenyan runners over the last few decades. 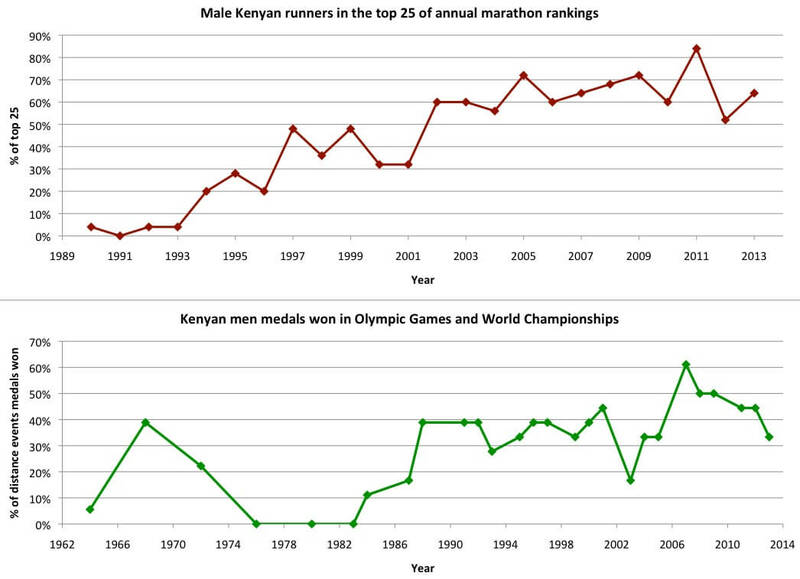 As a teaser, below is a graph that shows the progressive rise of Kenya in medal events and the marathon. The top panel shows the percentage of Kenyan runners in the Top 25 of the marathon rankings annually, since 1990. Does anyone out there remember the time when there were quite literally NONE? That was the case in the early 1990s. Quite remarkable when you think of the current situation. The bottom panel shows the percentage of distance running medals (800m upwards) won by Kenyan men at the Olympic Games and IAAF World Championships since 1964. The first even Kenyan medalist was an 800m runner, Wilson Kiprugut, who took bronze in 1964 in Tokyo. It would take four more years, and the boost provided by the altitude of Mexico City, for the gold rush to begin, but since then, barring two Olympic Games where Kenya did not compete, it has never abated, with Kenyan men regularly winning over 30% of the available medals. Again, when you consider that over 90% of these are Kalenjin (and 50% are from a sub-tribe called the Nandi), you appreciate just how concentrated this pocket of endurance excellence is, which is why the paper we’re working out right now should be so interesting. Also of interest in the graphs is that the track success preceded the marathon success, which I’d interpret as an indication that it was the change in economic incentives in the 1990s that helped catalyze the marathon transformation. Certainly, the physiology was always present – it’s not as though a new breed of superhuman marathon runners was born in the 1970s, waiting to take over the world’s roads from the 90s onwards. Rather, the increase in prize-money, shoe company involvement and prestige drove more and more Kenyans to the event. The world’s richest gene pool was suddenly flooding the cities, and the result is the graphs you see above. Those graphs are, however, only the prologue to the story. The story is the physiology, the environment, the culture of distance running, and the individual stories like those of Dennis Kimetto and Dixon Chumba, which make us marvel at the achievements of these athletes. There will be more to come on the subject! P.S. if anyone out there fancies some analysis, let me know. For instance, it would be interesting to compare the evolution of different events. Take the best time in 1990 and find where it would rank in each of the years since. I bet few will have fallen quite as far as 107th, like the marathon! Work out the average times of the top 10 from each continent over this period, and do the same analysis I’ve done above, but for the major city marathons dating back to the 1980s. There are stories in all that data. If you have the time to analyze, we’ll co-write an article on this site!